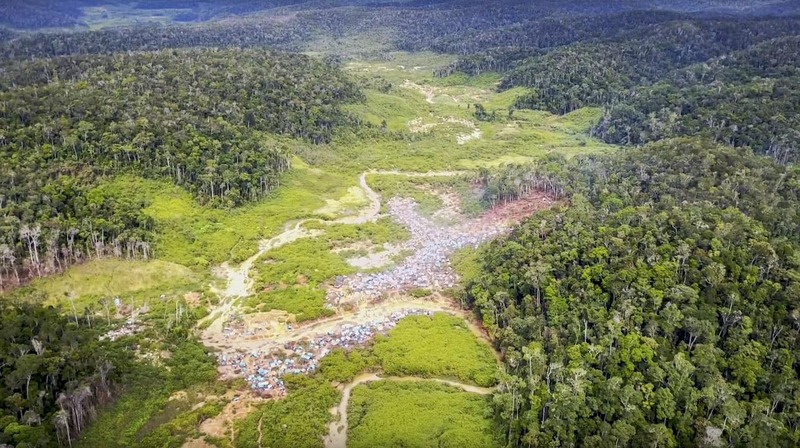 A “rush” that produced world class sapphires close to the village of Bemainty, in the wet forest in eastern Madagascar, reached it’s peak some time after October 2016. Some of the sapphires were similar to the highly-prized Kashmiri sapphires and laboratories were misreporting their origin (Krzemnicki, 2017). Vincent Pardieu gained access to the site in February 2017 to collect samples and results from his preliminary study show that both high and low iron sapphires can be found in the Bemainty area, and that accurate origin determination for them a is not easy using basic laboratory techniques such as inclusion scenes and trace element chemistry (Pardieu, 2017). From 6/52017-8/5/2017 I gained access to CAZ and revisited the Bemainty mine now known as “Tananarive Carrier”. I documented it’s expansion and evolution, as well as two new sites called Sahambato and Ambodipaiso. I estimated there were 1 000 miners in the Tananarive Carrier area, but there could be tens of thousands in the newer sites. I also collected samples for Lotus Gemology’s research on origin determination. With thanks to Association Française de Gemmologie & Lotus Gemology for supporting the trip.